His Eminence Chöje Ayang Rinpoche’s teaching schedule for the US, Canada and Mexico in 2011 has not been announced yet. For information on Rinpoche’s Europe and Asia schedules please visit ayangrinpoche.org. The Guru Rinpoche Drubchen has been completed. Thank you to Grace Wong for these Photo’ s and video. 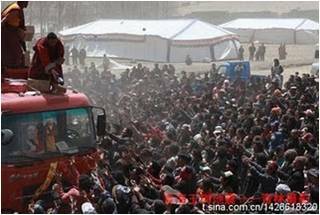 Many of you have written to find out how you can help the survivors of the terrible earthquake which destroyed the city of Jyekundo (Jyegu, or Yushu) in Eastern Tibet Tuesday morning. The epicenter of this earthquake was actually in Rima, Ayang Rinpoche’s birthplace village and location of Ayang Monastery, as well as the new Amitabha Foundation-sponsored clinic and boarding school. To date we have not received information about the fate of Rima villagers and monks, but conditions in Jyegu, a city of 80,000 residents just 2 hours away by car, are extremely serious. The first earthquake and more than 780 aftershocks have caused the collapse of most of the city’s buildings, burying many people. According to official reports, by 5 pm on April 17th 1484 people have been killed, 417 are missing, 1,394 are severely injured and another 12,088 are injured, and 80% of residents are homeless. Sadly, 115 teachers and students were killed at the primary and normal school. We heard that the Yushu County Hospital, our partner for the past 6 years, was completely destroyed, and medical personnel have set up emergency operations in tents. The new Yushu airport has been reopened and injured people are being flown out of the area for treatment. Jyegu is hard to reach even under normal conditions. Damaged roads and traffic accidents have made it difficult for equipment and aid to reach the area. There is a growing shortage of food, water, blankets, tents and medicine. Monks have been distributing food from their monastery stores. We received most of this information through our program manager, a Jyegu resident who is currently in a Masters program in the US and who previously worked for a local NGO which is now coordinating aid efforts. Fortunately, members of her immediate family were not injured, although her home was destroyed. Ayang Rinpoche has also talked by phone with our program liaison, a government official in Jyegu. Rinpoche is considering carefully how the Amitabha Foundation can best assist during this emergency. 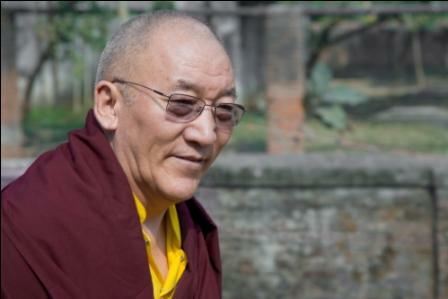 After talking again with his contacts in Tibet over the next few days, Rinpoche will let all of us know if it will help for us to collect and send money to the area. We are also discussing aid prospects with our partners at Rotary and Direct Relief International. 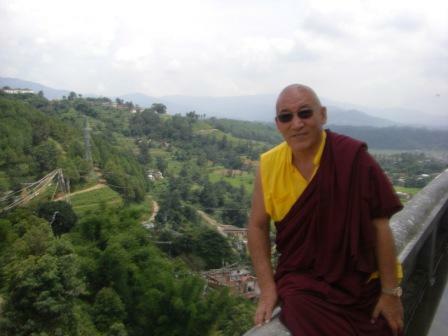 In the meantime, Rinpoche asks those of us who can to please recite the Long Aspiration Prayer to be Reborn in Dewachen. People may also recite the Short Aspiration Prayer and the Amitabha Mantra (see below). Thank you for your prayers and concern. 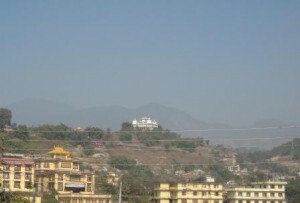 Rinpoche has been supervising continued construction on the new Amitabha Foundation temple in Nepal, which can be seen from all over the Kathmandu valley.